Got Allergies? There could be a sneaky culprit. Allergy season is in full swing with all the trees and flowers in bloom, yeah for our allergies. And outdoor air quality is at its finest making us all miserable with the itchy watery eyes, sneezing, sniffling and yes headaches galore. But did you know indoor air quality is just as much to blame for your allergies? According to a 2015 Pima County Community Health Needs Assessment, Chronic lower respiratory diseases are the Third leading cause of death in Pima County. 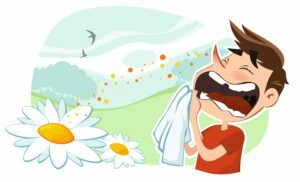 Let’s take a look at what could be causing your allergies to be extra spiteful. Dust, mold, outside allergens being tracked inside, and dirty air ducts are just a few things that can make the the quality of the air in your home poor. Leaving your windows open to get that cool breeze that is blowing through also blows pollen into your house. Just doing a few simple weekly tasks can help alleviate your symptoms if your allergy pill is not doing the trick. Such as washing your sheets weekly in water at 130 degrees, vacuuming and dusting, and having your air ducts cleaned. Even running your fan after a shower for 10-15 minutes will help keep the mold from forming in your bathroom. Another great option is to have a company come out and do an Indoor Air Quality assessment on your home. Russett Southwest offers an Indoor Air Quality test and they will provide an assessment of your home and offer solutions that will help with your Indoor Air Quality. To learn more about Indoor Air Quality or to schedule an Assessment of your home go to https://www.russettsouthwest.com/heating-cooling-services/indoor-air-quality/ or give us a call at 629-9676. We would love to help you with all your heating, cooling, and air quality needs!